Protect Yourself from Snake Bite! 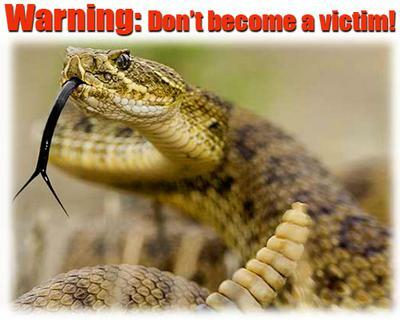 Did you know that thousands of people in the United States are struck each year by venomous snakes?! When bitten, venom travels through the bloodstream, destroying tissue and causing swelling, internal bleeding, and intense pain. Some bites are fatal. Don't take a chance! Snake Gaiters and Snake Chaps and Snake Boots help protect you against deadly snake fangs and are available in many styles to fit men, women, and kids. Since 2013, SnakeProtection.com has been a trusted source for the best snake protection products on the market. We take the guesswork out of staying safe from snakes— whether you're working or playing in the great outdoors. Who Needs Snake Bite Protection? Anyone who spends time in snake country, which can be the desert or woods. Snake Gaiters are commonly worn by hikers, hunters, fishermen, ranchers, surveyors, realtors, landscapers, gold prospectors, metal detectorists, workers in the oil, gas, utility and timber industries, the US Border Patrol, US Forestry Service, and many more. "I received my gaiters yesterday – and I was blown away. I walked around the house with them on for about an hour and they felt amazing and didn’t impede walking, sitting, squatting, or kneeling. I am so grateful to have a quality pair of gaiters as we discovered over the last few years not many rattlesnakes out this way actually rattle anymore. So in short, thank you for a great product and all the communication from you letting me know the status of my order. It’s unlikely I’ll buy a pair again as these seem well made enough to last forever, but my friends are going to know where to get them when they see mine. Thank you!!! " While no product can claim 100% protection from snakes 100% of the time, the manufacturers represented on this site are dedicated to developing the very latest personal protection equipment. For fastest service, please place your order over our secure website. Doing so provides a detailed receipt that is immediately e-mailed to you. We're a small business and like it that way, and as such, we greatly appreciate your business and referrals — thank you!